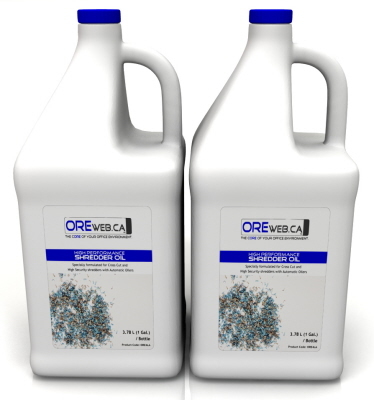 OREweb.ca® carries our own shredder oil & lubrication, as well as the manufacturer brands of shredder oil bottles in various sizes and case packs. Our formulated brand is just like the manufacturer's brands...at a lower cost per litre! All our high performance shredder oils are designed to meet or exceed manufacturer specifications and will work in any brand of shredder. With proper lubrication and cleaning, you can extend the life of your office equipment by years. Proper oiling reduces wear and cleans small particles of paper and other debris from building up inside the cutting mechanism. It is the most important preventative maintenance option for your shredder. Save on a case of 6 bottles of 500 ml (16.9 oz.) OREweb.ca® shredder oil specifically designed for manual oiling & lubrication (not for use in shredders with automatic oilers). 30% more / 30% less cost per ml / bottle! 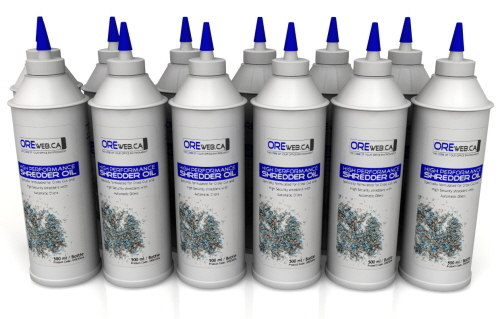 This shredder oil can be used in any brand of paper shredder which does not have an oiler factory installed. Specially formulated for Cross Cut and Strip Cut shred formats up to level 3 security. Easy to apply using the convenient pour spout cap. 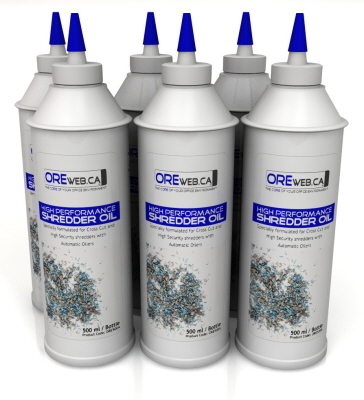 Save on a 6 or 12 pack of OREweb.ca® shredder oil for automatic oilers. 500 ml (16.9 oz.) bottles formulated for shredders with factory installed oiling systems. 30% more / 30% less cost per ml / bottle! 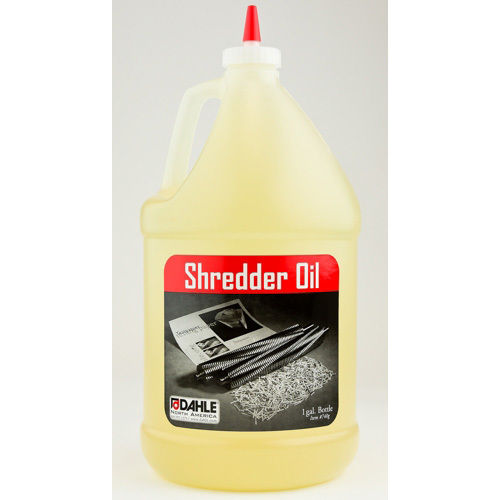 Specially formulated shredder oil for Cross Cut, high security and super micro cut shred formats including, level 4,Type II (level 5) and Type II (level 6) destruction formats. Simply pour the bottle contents directly into the oil reservoir to keep the internal cutting cylinders lubricated and free of debris. Destroyit Shredder Oil 1 Pint (500 ml) / 4 Bottles Case. 4 bottles of 1 Pint (500 ml) Destroyit Ideal-MBM Shredder oil (Product Code: ACCED21/4) is specifically formulated for Destroyit Shredders. Use shredder oil as recommended by your Destroyit shredder operation manual. Properly cleans and removes paper debris. Lubricates your shredder for longer life and durability. Dahle Shredder Oil 20740 - 355 ml / 12 oz. Bottles - 6 per case. Dahle 20740 (or, 740) shredder oil - 355 ml (12 oz.) bottles, 6 per case. Specially formulated for lubricating, cleaning and removing debris from your shredder cutting cylinders under normal use. Maintains the life of your shredder, genuine manufacturer supplies. Designed for shredders with Automatic oilers, our bulk 2 case pack of oil meets manufacturer specifications for all types of document and multimedia destruction models. 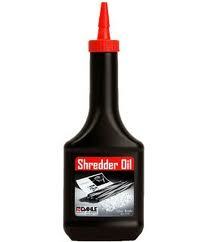 It is recommended to ensure your shredder is properly oiled with the right shredder oil. Proper oil cleans and lubricates the cutting cylinders, and ensures proper removal of debris during the paper shredding process. Using improper oil can lead to a build up of small particles on the cutting mechanism, and eventual clogging which can be costly to repair. Specially formulated Destroyit Paper Shredder Oil. 1 Quart (1 Ltr.) rectangular bottles 6 per case. Square/Rectangular bottle designed for models with factory installed automatic oiler with the side mounted holding case and feed tubes. Properly lubricates, cleans and removes paper debris and fine particles from your shredder cylinder parts. Use this shredder oil as recommended by your Destroyit operation manual. Dahle 20741 (Or, 740G) Shredder Oil - 3.78 Litre (1 Gal.) Bottles, 4 per case. Specially formulated for use in all manufacturer models, whether refilling smaller bottles or using in bulk, department or high capacity shredders. Properly cleans and removes paper debris. Lubricates your shredder for longer life and durability. 1 Gal. (3.78 Ltr.) 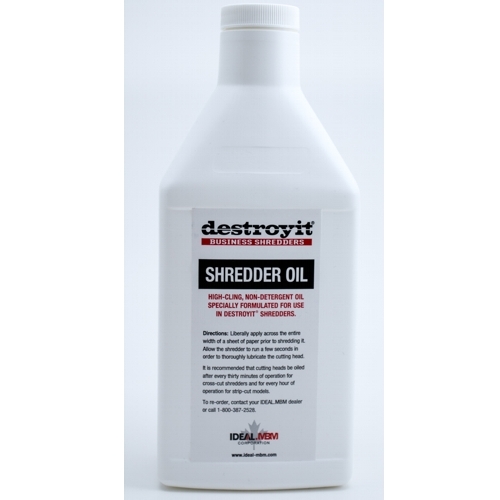 x 4 bottles - Destroyit Ideal-MBM Shredder oil ACCED21/G is specifically formulated for Destroyit Ideal-MBM Shredders. Lubricates, cleans and conditions shredder cutting cylinders and removed paper debris build-up. Use shredder oil as recommended by your Destroyit shredder operation manual. Recommended for use in refilling shredders equipped with automatic oilers. Lubricates your shredder for longer life and durability.